Article by Tessa Allinson, Interview by Tessa Allinson, Michelle Rodgers & Nathalie Holman. A play about searching for a better, more utopian world is an apt choice for a project uniting students from four different universities from around the world. An American boy and a Finnish girl are Euelpides and Pisthetairos type characters in this abstract performance aiming to take the essence of Aristophanes’ “The Birds” and presenting it in a way that requires no language, therefore is accessible to all. The concept of their performance is original and inspiring, start on website that allows introductions and early brain-storming between the students and then have an intensive few days together accumulating these ideas and working them into a performance. We spoke to the students and the lecturers from all four universities and they were happy to share the positives and negatives from the whole experience. Interview with a group of students involved in the project “NE(s)T” performed at Ovocny trh on the 20th June 2007. Present students: Joslin Mckinney (Tutor from Leeds, UK) Ina Niemela (Finland), Emily Lippolis (Pittsburgh, USA), Jake Degrooft (Pittsburgh, USA), Danielle Casey (Wellington, New Zealand), Jess Simpson (Leeds, UK), Jess Wood (Leeds, UK), Laura Hughes (Leeds, UK). Where did the original idea come from for this project? From Aristophanes, “The Birds”, it was a title given to us because of its relation to Scenofest. It started as a collaboration between tutors at different Universities over the world. Most of us tutors knew each other before the project started but we have also got to know others through the process. We thought we would try and create a collaboration with our own students to create one big performance. We created a website that allowed the students to write blogs sharing ideas and thoughts whilst getting to know each other. How successful do you feel this concept came together? It has been an interesting experience. We have had four days in Prague and six months preparation on the website. It has been a good first attempt; there are a lot of areas that could be enhanced. The website could have been made more accessible to make communication between students easier. It was difficult coordinating time in which all of the groups could work together. We tended to separate off with people we knew, however it has all come together really well in the last couple of days. The ideas explored on the website did not necessarily have a big performance element and consequently only a couple of the ideas got into the final piece. However, over the last couple of days, the whole piece has come together so quickly and easily because we have had such a long preparation time on the web. The preparation time was spent collecting images that we were then able to work into a performance as we came face to face over the last couple of days. 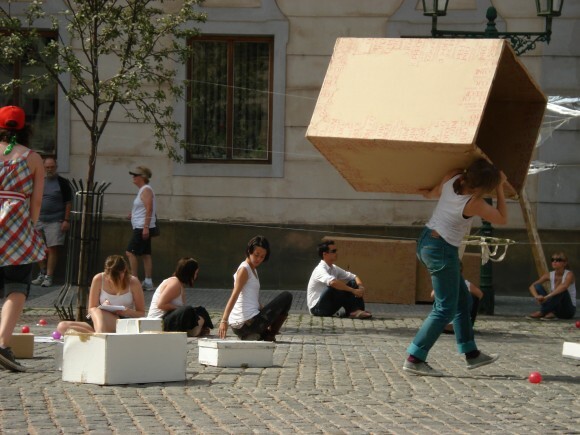 We have spent a couple of hour’s everyday since Friday choreographing and finding materials around the palace and Prague that could be used in our performance. For example, the boxes are from : Materials of time, materials of dreams. Would you work with this concept again? If we were to do this project again we would like to develop the website to make communication easier. We would also like to work within a theatrical venue because working out here today has been difficult. It has been hard getting all of our resources together because there is so much going on around PQ. But as a concept, yes we would like to develop this idea.